Police are searching for missing Jared Hanna, 28, who was last seen Saturday evening at several Alton bars in New Jerseyville. His truck was found about 50 miles from his home. The police found that the truck belonged to the mother of Jared. When the family were notified that the truck was found, they filed a missing persons report. Jared was seen at The Big Muddy Pub, 204 State Street, Norb's Tavern, 2505 State Street in Alton. Heather Hanna, Jared's sister, said that Jared has two children that she watches while he goes to work at Oros and Busch Application Technologies, and he wouldn't just leave because of his children who he has full custody of. If you have any information you can contact the Jersey County Sheriff's Dept. or Alton Police Dept. Also you can visit Jared's Facebook page at "Help find Jared Hanna." As far as I know Jared is still missing. Tarot might be able to shed a little light on the situation but it is not 100 per cent accurate and I cannot guarantee that all details will be. Tarot generally works with elements past present and future and may repeat information already known - however it can often highlight other matters. Please go to other sources for factual information. Well as you can see a nice picture of Jared above, smiley and coming across as a really nice jolly personality. I often feel very sad when people go missing when I see them so animated in their photograph. However, taking a first card for Jared and asking what might have been happening around the time he went missing I receive this card. A really difficult card here as it might not be a good start. Here is the four of swords and judging by the reversed swords before we get here its tricky. The four of swords can be a situation where somebody is 'with held' this can be against their will literally or it could be a thought that runs through a persons mind, being held up. The three tells us that Jared is 'mislaid for a time' that doesnt seem to imply he was going to disappear voluntarily. There are some indications of an altercation with somebody or possibly a quarrel or stand off and that might have created a problem. The four of swords can sometimes speak of banishment, isolation and even a form of imprisonment. I think of that as being withheld really. Im feeling some sort of angst around the five of swords and the six and I keep thinking he might be around a coastline/waterline (either in name or otherwise) or he might feel he was or is facing some kind of 'stormy waters' or difficulties. I think he seems stressed mentally, Im getting some kind of overload here on someones thinking. Six of Swords shows him being held up in its delayed reaction. There may be some 'apology' due here from someone who has been away. I am seeing some kind of depression with Jared in this card but I cant make up my mind whether he was looking for some peace and quiet from problems or whether in fact it was forced on him as I did,nt really feel that he intended to disappear. Its as though he went off that day and somehow temporary absence has become a bit more permanent! Swords are not very nice cards, but contrary to belief, when they are reversed they are not all bad. They can actually look worse then they are. The direction I see is EAST on swords cards, this is reversed of course and it can be awkward to decide but East is/was the main direction that I have. We still have to bear in mind that swords are harsh cards, and though we make light of them when we can it can mean a person can run into severe troubles and this cannot be overlooked. There are two other people in these cards and they might not have been friendly. Asking where Jared is and bearing in mind that Tarot cannot really name places as such, we do have the direction South, so our reversed four of SWORDS could have marked a SOUTH EAST direction. I see that we have a very sporty element on the 5 of wands so a SPORTS name or VENUE could come up here. Also so could a motel or a building of some description. The six sees movement towards a town/market or populated place . The word LAUREL and /or VICTORY could be useful descriptions/names. I also see heat/something hot here. Fire is the obvious thought but also it could be a heated debate/exchange with a group of people (males?) Again the waterline seems to appear around the three of wands so Im wondering if there is a coastline or perhaps a water name where he might be. 5 of wands can also be sports fields gyms anywhere of that nature of where people might carry out sports and that can also be the name of a place. I have not looked at the map yet. Somewhere in the distance MIGHT be an airport. I say this as we travel the wands route and I see also possibly between two counties as we have a border line here and possibly even a district that is 'hilly'. I see fences and barriers - almost makes me think of a football ground but again its very easy to suggest things on these cards. Although there is a 'country feel' to wands cards at times, I rather feel that Pentacles are more agricultural and wands give me more of civilisation feel or places connected to people. I feel there might be a message regarding Jared before long or some information given that could be useful. Perhaps an older female might speak up about it. Asking when Jared will be found - Tarot is giving me a stationary vehicle. That is not amusing of course because we know that a vehicle was found and that is not helping me to give information on this card, therefore I will ask this question once more. However, before I do, I will say that this card can a stagnation of events but gives a North South route and walking. The knight gives us 12 as a number so whether that has anything to do with Jareds vehicle I am not sure, by this I mean 12 in distance from it or 12 in time after the vehicle is found. I think I will ask once more about this. Tarot has kindly pushed me back down the pentacles cards and given me the three. I would think then that this card tells us within THREE and NORTH. Pentacles are often three years but when its reversed it can strike out the years and just give us a THREE to take note of so Im afraid that is what I have. Notice it is reversed and I toy with SOUTH as well as North but it could be in the direction of North but the word SOUTH might come up for description also. I am seeing finance and business on this card and a kind of resistance to being found. An Arch or Bridge can be seen here and we are aware of the Joliff Bridge Road being the place where Jared was sighted. I would have thought that area would have been combed thoroughly but perhaps there might be a clue there that might be overlooked. Skills are not used in that area according to tarot, so it might be suggesting that he 'lost' something here that could be found. Maybe an article perhaps. I am seeing a building/business or otherwise somewhere and I wonder if he was planning to call in there ? In some way I still feel his security is compromised on the one hand but seeing him quite a strong person on the other. I feel Jared might not be in the best health and yes his security may have been compromised. I see him being 'evicted' from somewhere or asked to leave but I dont know what the time scale of this would be before after or when. I think there is someone who is what I would consider a 'dirty businessman' here who might be difficult to trust. Pentacles are agricultural cards - whereby wands are not especially so though can be linked by county or country type places. Tarot might have the wrong end of the stick with Jared and I apologise if its a bit askew at times but I hope that all ends well with Jared. However, cannot help but feel he had some problems to deal with that made him out of his depth? Three of Pentacles can often point out December and January as months of importance but also when it comes to work/business/financial matters. If there is anything particularly outstanding about these months then perhaps it might be worth thinking about what might have occurred in them previously. It might refer to the future but I have to put it both ways. The Ace of swords can speak about drugs, and it can affect the respiration as can alchohol. If there were any quarrels that anyone was aware of when Jared was out that evening it might be worth coming forward about those. Anyway I will leave these thoughts and hope something somewhere might be useful. This is a brief tarot synopsis and I will come back to Jareds tarot if he is not found soon. Family and friends are organizing a search Saturday for a 28-year-old Jerseyville man and single father who hasn't been seen since last week. Jared Hanna last was seen on Saturday, July 2. No one in his family or any of his friends has heard from him since his disappearance and they are concerned. "It isn't like my brother to just disappear," Heather Hanna said. Heather Hanna said that her brother is a dedicated father and responsible when it comes to work. She said that she watched his daughters whenever he would be on a job and, because he had full custody, she knows he wouldn't just leave without any notice. I have been asked to further look at Jared's situation. Tarot is not 100 per cent and I have no guarantee of what it will tell us or whether the information covers the past present and future as tarot looks with a sweeping eye at all three. Because of this I get 'messages' that glimpse into the situation but I cannot always place exactly what period of time they are talking about. Sometimes not ALL descriptions apply. Obviously, as Jared's mother has asked about the situation I am also concerned that what I write must be as accurate as possible. However, all I can do is give what I see and Tarot does not provide a Map of names for me to pinpoint exactly where a person can be. It is very frustrating but Tarot chooses what it gives to me and all I can do is try to put over whatever it is telling me and hope somehow it can give some kind of Clue. Now you will see this card for the current date. It is the Sun reversed. Though I have asked Tarot for information about Today's date, again, I have to remind you that I cannot rely that Tarot will produce a definite piece of information about today. When you see the Sun reversed you know that there is a family in trouble. You also know that travel is problematic. Travel is halted. We know that Jared's vehicle was found and where it was found. It is now important to try to track where Jared might be. It is always best to read the previous Tarot as it has given us clues and then combine this latest card of the Sun reversed. The sun reversed gives us a path of 30 and it is reversed. 30 could be a date or a route or have some other significance. None of the Tarot is written to be judgmental therefore it must not be hurtful with what it suggests. However, this card is linked to the Emperor who is either the father or the boss and it can also represent being a 'non biological father' or indeed exploring that, can suggest problems being a father commanding respect and obedience. It does and can represent a boss or someone in work that Jared might not see eye to eye with. This card can link directly to the family but might be more reflecting problems and weakness in family matters. When the sun is reversed it is giving us a RED BANNER perhaps the descriptions of the Sun might show us where Jared is. Red which is also associated with the Emperor is here. We have no direction on this card whatsoever but there is water in the area or names that are water names because the Emperor is also linked to the hanged man which is a very watery card and can show trees/poles. The Sun card gives us the word WALL as the sun is enclosed in a wall but it is reversed which can suggest that Jared is 'under something' or by somewhere perhaps with the name WALL . The Sun reversed can also describe someone who is in a basement, it is a card where the 'light does not get in' so perhaps it can show us that Jared is 'hidden' somewhere and not easy to find/spot. The number 19 is on the Sun card and I also am getting links to a mother figure. Whether this is Jared's own mother or the mother of his children I am not sure. I am also receiving some deceptive influences here. Perhaps being a father was very difficult for Jared? I understand he has custody of his two children. It is always worth looking at all areas of this to make sure he did not have any enemies. Sometimes his enemy could be his mind. I am seeing problems that someone is having perhaps with their stomach. I also see something sharp so perhaps a sharp pain. The sun reversed ALWAYS shows children in these cards and in this case there are two. I am seeing a situation where there is over dependence on parents here and Im not sure how that is being suggested but all I can do is give messages from Tarot hoping that its overview makes sense to somebody. The sun reversed can show a 'broken wall' . It might suggest that he is linked to a person in the family but more coming from the past. I feel as though he has made decisions perhaps that he might have cause to regret. Did he feel overburdened, was everything just too much for him? I really feel as though his 'world is upside down' and he is not going anywhere. I also see that Judgment gives us issues with health and perhaps there is a health building , hospital in this card. I see that there is a 20 on this card and it could be a distance or a route. I would take into account all the previous information for Jared and read it along with this further update. I do not feel Jared was well whether something had upset him and there were cross words or whether in fact he was actually injured. I do see a strong opposing view in the stretch of swords. Maybe Jared wanted to escape from burdens and decisions he had made. However, I would take all the little clues and see if they can help. The sun reversed can be about anger and irritation in the family and may represent anything to do with travel. It is also worth looking at the Fool and any area that has rock or stone in its name or a wall of stone. Did Jared have any problems with work ? I am not sure how to connect all his dots yet of where he worked, where he lived, where his vehicle was found. But I think I have tried to give some indications of what might be glimpses of the situation. I also have a cemetary here or Church yard or even a street that comes up with that name. I do not know whether that is a pointer of place or not. Everything that is in the tarot 'picture' of directions seems to tell me it is on the Map. I will continue to think further for Jared as I am always aware of other details I might have missed. Tarot does explain things better then can be imagined, but it is up to me to try to interpret this. I know that mistakes can be made or I might have something cross wired but I just do what I can and hope that it helps. It did occur to me that the Sun is also the solar plexis and this means the HEART. Maybe at some point there is a connection to 'HART' such as a road or place? I do not know if it is a past connection or not, but Rock Hill Trials, Hartford, and Wood River might fit at some point?? The word East has significance with Jared whether direction or otherwise. Though the sun does not point a direction it is classified as the destiny of the East. I'm not clear whether I should be looking at a reversed angle to this but have mentioned directions in the previous Tarot which may or may not help. CARLYLE - The recent discovery of some personal property belonging to a missing Jerseyville man has prompted a renewed search Saturday in the rural area of Clinton County where he last was seen in July. A motorist reported seeing Hanna the previous midnight walking along the road, but a resident is believed to have seen him hours later at his door, said Clinton County Chief Deputy Mark Etter. I have had another look at all the Tarot cards to see what astrological advice may be given regarding location and here below are descriptions of places that seem to be associated to Jared or those around him.The directions do seem to tell us that South is the ultimate direction to find Jared (or South in a name of place?) though of course one cannot guarantee anything but it does seem to agree with tarot with many of the points both here and in the tarot regarding descriptions. I leave the possibilities below. Places that high off the ground/ mountains and hillsides. Places that promote windpower, like windmills, air froce bases, airports, communication towers. Places you might have hunting or hawking, sandy /gravely ground, saw-pits, sawmills, wood storage, wood barns or out-houses that are apart from other buildings. Agriculture type places, storage for harvest etc dairies, granaries, malt-houses / breweries, cornfields, hay-ricks, greenhouses, barley, wheat or peas or where cheese and butter is churned or stored. Inside the house storage or places to store things like libraries, book cases, books, pens and reading/writing instruments are kept as well as all office equipment, study halls, office areas items used for book-keeping. pantries, closets, cabinets, drawers, medicine cupboards and drug stores. Places where you repair things or store them, tools, machinery etc and places that have live in quarters. Small animals. Farms, farming equipment, wood stores and places where farm animals roam. Fallow or bare land, barren fields, land bushy and thorny, land with dunghills, compost heaps or soil prepared with manure. Shipyards storage or boatyards. Places that divide and contain rooms / territory ie walls, garden fences, gateposts and international borders. Also significant, mausoleums, church yards and ruins. Inside the house low dark corners, on/near floor, doors, closed in or confined spaces, waste disposal. WEST - NORTH EAST - SOUTH WEST - TO SOUTH. Dee has provided a map which she feels MIGHT be the area that Tarot is describing. I have not got a single clue with maps. I just post what I find, but see what you think of Dees Map. I have left the link below the Icon. Please bear in mind that this is not guaranteed and Tarot can mean somewhere else entirely. 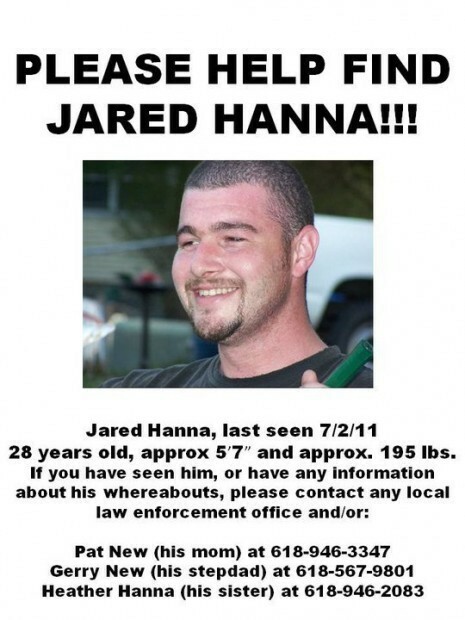 Jerseyville man has been missing one year | year, hanna, jared, jerseyville, missing, one, day. Below are more possibilities of areas on two separate maps. Jared's mother is very keen to locate him and Dee has sent these two maps composed from the Tarot outlined above. If there is anything else I can add I will do so in due course. This map has been updated via new thoughts from Dee whilst revising the new Tarot information. I have been looking for news of Jared but cannot find anything at the moment however, thought I would post the Facebook as often there are comments there and information about searches. Though time marches on, I have not forgotten Jared and have spoken to his mother who is a patient and loving mother. I will look again to see if I have just missed the point in my Tarot. Often I need time to get away and re-think things but I will have a little study of the cards once again as soon as I get a spare moment. Jared is in our thoughts and I hope everyone remembers to keep looking for him. Feeling that I should work through the cards again - I did - and I feel most of my new thoughts mirror much of what I felt initially. What I feel from my first card is the debilitating effect from reversed swords. They are not great cards because you know they are going to produce deceit, roguery, hidden factors, liars, half truths or concealed evidence or even witness statements that seem to fail the 'smell' test. Some evidence of Jareds belongings were found in the area of his truck but I had a big problem about the 'journey' simply because my Knight was reversed. In honesty pentacles are drawn out and suggest travel. This card also shows a change of location and a safe port or place to go with fresh clothing etc sometimes even business premises can show up on this card but so do fields and everything green and agricultural. Swords particularly the card produced can show church elements and Jared was last sighted in Godfrey - well I suppose one could put church and god together here. But I have problems with the 4 card. I still may need time to think things through but here we have a situation where we feel we cant move, or we feel restricted in some way, it could be in our mind even because I have felt there was sickness in the cards. But sickness is also illness and it could represent Illinois EXCEPT it is reversed. When I look at the travel elements reversed, I see the stationary vehicle, but I wonder why I did not receive 14 for Centralia as 14 is a center of something. (Tempermence) I keep coming back to the 3. The 3 would give me the Empress reversed where I would get Roses, Spring, Hollow, Ditch and one of my cards gives me the name Michael. I also have a Diamond on my Pentacles. Looking at the Map I did wonder about Michael Hollow Rd which is near the Diamond State Park by Jerseyville, I dont know if that is in Jerseyville because I am not familiar with that area or country for that matter. I see quite easily all the areas around and surrounding the vehicle too and I found myself looking at the map for the most of this evening and saw this place on the marker west of Jerseyville. All the areas on the map that Dee has put there for me do make a lot of sense but something does bother me. Now when you take the minor card into the Major I wondered if Jared was over dependent on parents or whether it meant his children were and he had a lot going on with himself mentally. I think there are problems there and I did raise something of this nature in Tarot. Because both the pentacles and the swords are reversed it can suggest a thief. Someone who steals from you. Rogues are there after all and I feel as though I do not want to commit a theory but with the swords card on a 'return' I feel as though something was moved or put somewhere. I am not sure whether that was Jareds belongings being put where they were found. I feel too that if Jared had gone to Centralia that he would have returned towards home because that return is on there. Looking at my Pentacles I see problems with work - or the lack of it - so I do not feel myself that Jared did go to Centralia for that reason - I do feel that there is money or financial debt here though. There may even be a bad business deal gone wrong. There appears to be quite a few things circulating in the cards at the time of disappearance, some may be past some future. I also have a couple of morbid elements regarding undertakers, morticians and funerals. Someone is apparently laid to rest in our four of swords but because of the renewed activity on this card I did not feel it was Jared that I was looking at even though the initial scene represents peace, I feel that it is a past event yet I feel some kind of restriction or something that 'with holds' Jared and I cannot quite get my head around that. What I do see is that nothing in the swords comes right. There are relationship problems as pointed out in the first card. Sometimes a past fight, quarrel or altercation that seemed patched over might come back to haunt us. We can make enemies or it could just be a heavy emotional relationship or situation that we just cant seem to let go of or it wont let go of us. Three people are given in the first card. Sometimes its a clandestine relationship othertimes its three people involved or people who are mislaid but there is that sense of betrayal in the air, where perhaps if something happened in a quarrel or some fight that a person does not want to get involved with takes on a new lease of life. Painful elements are pointed out. Of course sharp weapons can appear on the scene with swords also. Its a real running with the scissors type of suit so unfortunately when the swords are reversed its going to bring up all kinds of problems mentally and to do with others. Drugs and drink could very easily be here too. Might only be medication but who knows for sure - we feel that if drugs or drink were offered at any stage it would not have been a good idea to indulge if that was the case. I feel almost as though Jared has not used his judgement about something carefully because he seems blindsided. I do see a river and being near there at one point and two islands in the background - whatever that amounts to. Water rock stone cement tunnels bluff and canyon are all words that can come up with the swords cards. They do not always apply but often they do and strongly. Railways, airports, golf courses, guns, knives, water , mountains and windswept areas are often part of these cards and can come along as place names or in fact can be trying to name a road if not be an actual part of the vicinity. I feel that its possible that more than one person could be involved with Jared's vehicle either in it on this long journey. 50 miles and we do have a 5 on the wands card, but I would need to convince myself whether this was Jared himself. It could have been of course depending on whether he had business to attend to at that distance though it rather seems a long way. There is someone who is tall and slender with fair hair and perhaps either pimples or dimples they can have their hair short or long it certainly is capable of being grown long and it could be more of a light brown sandy colour. The other person I see has goggle type eyes and is not tall but has a round face. I also see a person who is an adulterer likes to hang out with a drink in bars but puts himself over as quite a nice person neat and spruce but really spends money and is a bit over lewd. Tarot describes the person as someone who happily jumps into bed with anyone - so I am not sure about that. I have words like Garden, Fountain, beds, dancing schools, bride or bridle, the word fair and lodgings and wardrobes coming up or rooms within rooms, ventilation ducts, ceilings, upper rooms and windows there are other descriptions if you go to the locations ideas. I feel some of those descriptions will be names of roads/places. The royal names come up to which could be prince, princess, king, David etc as well parks museums valleys and monuments - animals too. There are dental and bone elements and a valley with a river running through and a 'mountain' . Jared's vehicle could have been stolen and his belongings dumped that is a possibility and he is nearer to home or of course he could be somewhere on the map pointers that have been set out by Dee who knows how to use the google maps and put in the little pointers which I dont seem to master very well. The fact that we had the Sun arrive when I looked again on a second sitting gives me problems. It suggests everything about a person having plenty in their life, business home family but at the same time it portrays something quite different - that is the card that can show basements/cellars or just being in the dark somehow as light doesnt get in when this card is reversed. It can suggest sunstroke too as the sun burns the person when its reversed and can cause dehydration. I just see somehow that with the world reversed ' we didnt go anywhere'. Thats the bit that bothers me because in that card someone is afraid to get out there and venture somehow - there is a lack of confidence in them and it shows an incompete journey. If we carried on from there we can see that North West and North East could figure and thats when we lose belongings but I feel that we dont lose them so much as they might get stolen. We start with a bag and we lose a bag and our belongings. We also have the name WILL or MILL and some technical college here. It might be jumbled but tarot can tell us a lot of things with one card - Aleistair Crowley ' one card can tell a whole life if you know how' - That is very true as long as we understand. There are references to sweet smells flavours or sugar - problems with the blood, breathing, lungs buttocks and possibly back. Maybe some confusion or depression possible too or problems with neck and head. I felt I saw 'construction' elements or workers with respect to the Wands but I dont feel 'we got that far' so I was not sure if this was a vicinity pointer or a work effort that was going on somewhere. A B J D and R may be initials of people or places. Mother is very strong in these cards particularly next to the Sun. I feel like his mother has passed him perhaps. I feel that there could be a problem also of getting lost in the dark as often the moon card will show a path by a river and we cant see where we are clearly. We do have to be careful of holes, camping sites can come up because we have 18 breaking to 9 on the moon - if we were going to see a man - we didnt! Being off the beaten track can come up here bridges, water its all there but I wonder if Tarot is picking up on the hearsay and which one of our cards is giving the true destination of Jared. I may have to draw another card but I wanted to just run over these cards with you again. Its true that reversed swords and pentacles can take away the stability of a person and can impair the health . The five of wands I have already spoken about but in reality that card shows a sham battle and I was even thinking of looking further North East to Battle Ground (is that what it was called?) but that is how hard it can be with location, so many places can actually fit. The only thing about Jared and the possibility of him being found was the Knight of Pentacles and the 3 of Pentacles. The Knight can suggest 12 or under 12 years add together is a 3 might be this year or they are numbers of routes. The interesting thing is that the 3 of pentacles is also a year card so maybe 3 years or number 3 has significance. We just have to see what happens with that. The sun card is 19 adding to 10 breaking to 1 - I keep thinking the 10 is his vehicle/trip - and bad fate and karma attached to that. Swords are violent cards which will mean that there have been some kind of conflict or quarrel at some point with someone and it might have re-surfaced or there was no way to stop the problem escalating - could mean fight getting out of hand too. I looked at Flora and the airport there, the one near Pyramid State Park and there were various others feeling that there is one in the vicinity where this man is to be found but also a railway. Swords can also bring up imprisonment and restriction so we have to bear that in mind too. It is still worth asking questions in Godfrey - is there a square there? I feel when I think of Jared I see a 'sanctuary' and a certain amount of isolation I am trying to decide if it was self imposed or not ie, whether it was that life got on top of him and he needed a break away or whether it is something more sinister. I still feel with the pentacles reversed that fingerprints are overlooked and some cctv and a research must be made but Tarot could be talking old news. I hope to write a bit more for Jared as I want to try to exhaust as much tarot as I can for him. One thing that did cross my mind was gossip and slander was he a victim of this because I did think there were a couple of so called friends who were a bit busy back chatting and he might not have appreciated that. Im not sure at what point but I just think he was going home. Why do I keep saying that? its something I feel wherever home was to him. Thats all I have for tonight. Before I go the name Bright? road or otherwise might come up summit peak or mountain. The other thing I forgot to mention is BALANCE and losing ones balance. I have to mention that. Can you please come back and give another reading. It's day 10!!! I just posted Jareds Tarot yesterday so it is a very fresh reading. I really hope they find Jared alive and safe. That is everyone's hope and prayer. But I must bring something up....have the police or anyone searched crooked creek?..it runs right through the path that Jared would have been walking along on Jolliff bridge road. Empathy, there are 2 baseball diamond at College Rd and County Hwy 5 (Shuttac Rd) very near where someone 'claims' to have seen and talked to Jared Sunday Morning at 830am at Eastwind Trailer Park which is all just South West of where his truck was found on JBR it looks to be about 3 miles. There is also a heliport at a correctional Center just south of the baseball fields. I say claim because searchers talked to these people and I don't know if LE have, and I sense 'false' around this for some reason. Hello Ghigau, thank you for posting this information. Hello, I will have another look later at Jared's Tarot and see what else might show. I hope very much for Jared to be found and I am so sorry for the distress your family must be enduring. I am thinking of you all. An update has been posted for Jared Hanna. I am not sure if this will help or not but I have tried to see if I can get anything further. Hello to Jareds mom. Im so sorry as I meant to come back in here and have been so snowed under but I will get to have another look soon. I cannot promise accuracy with location but I can try. So will look again very shortly for you. Still searching the areas in the area where he went missing and any other areas that are suggested we stil have nothing anything new in readings? Hello Jareds mom, please send me your email, I will not publish it. Tarot Map posted today 18th May for possibilities. Hello, I have lived in the area of Centralia/Joliff Bridge Road for over 20yrs and this is what I got from your reading. Keep in mind Centralia is the home of a Hells Angels Chapter. "I see that we have a very sporty element on the 5 of wands so a SPORTS name or VENUE could come up here. Also so could a motel or a building of some description." The key word here being "VENUE". The Venue is a bar in Centralia owned by a Hells Angel with two apartments on the second floor of the building. "Fire is the obvious thought but also it could be a heated debate/exchange with a group of people (males?)" Hells Angels is a male only motorcycle club. "I am seeing a building/business or otherwise somewhere and I wonder if he was planning to call in there ?" The "Venue" is a Bar/Tavern/Club business. Sun Reversed "However, this card is linked to the Emperor who is either the father or the BOSS and it can also represent being a 'non biological father' or indeed exploring that, can suggest problems being a father commanding respect and obedience." The head of a motorcycle club chapter is referred to as the chapter BOSS. The Hells Angel Boss in Centralia is the Owner of the Venue bar. "When the sun is reversed it is giving us a RED BANNER perhaps the descriptions of the Sun might show us where Jared is. Red which is also associated with the Emperor is here." You have already stated Emperor or BOSS is the same. Red & White is the colors of the Hells Angels. They predominantly wear red bandanas and most of their support t-shirts are red in color. The color red is the banner the Hells Angels carry. Nothing on the number "81"? The Venue wasn't even open under that name or management yet when Jared Hannah went missing. I forgot one last clue with the Hells Angels connection post. I am not suggesting the Hells Angels are involved in anyway. I just find it peculiar that all these "clues" fit something in the local area so well. also Joshua j mahaffey missing from the same area. also missing Joshua j mahaffey oct 12 1991 off of jolliff bridge rd. in the devils playground area. same area as where missing jarred's truck was found .William(bill) Stutz went missing jan 2 1997 .after his vehicle was on jolliff bridge rd. his body was found march 27 1997 in the crooked creek . William (Bill) Stutz body was found march 26 1997 about 40 yards from the crooked creek in a small field close to 1 quarter mile from the southeastern corner of the Centralia prison . And about 2 miles west of jolliff bridge rd. Jared's personal property was found Oct 2011 in this same area This needs more awareness ! Yes I have noted that two other people have gone missing in the same area. I do need to have a bit of time to sit and look over the details of Tarot. I have applied other methods of location in the last couple of years which I have been ironing out bit by bit and I might need to 'sort this tarot out' to see if I have missed something. Thank you for writing and for all the interesting comments here. Remember that Tarot is past present and future just to make life more complicated - and can see things we cant. Problem will always be the lack of finer detail but I will try to look again at this entire case. Information on Joshua j Mahaffey from Centralia,il missing from jolliff bridge /devil playground area is on the inter net. And the authorities consider terry martin and others as suspects. Information on missing on Jan 2 1997 and found dead on march 26 th 1997 William (Bill) Stutz from the jolliff bridge rd. and found behind the centralia prison.Is at the Centralia library in the centralia sentinel paper on mico film. And jared's truck was parked inside the entrance of the devil's playground and off of the jolliff bridge rd. And on oct 9th 2011 Jared's personal property was found behind the Centralia prison under a hunters tree stand in the same area as where Bill's body was found ! And to the people that think they are not related better wake up. Another fact is Jared's personal property found only 3 days away from the 20th anniversary of missing Joshua mahaffey ! Because the killers knew hunting season that year started on oct 1 st ! I would like someone to do another evp or hire that team that does a show o tv for haunted homes n such... Not ghost hunters , but something else.. When I thnk of it I will let you know. I live here in Centralia and did at the time of his disapearence. I don't know why I am so drawn to this case and him. They are building a new strip mall and hotel just recently over the winter built aspur walmart.... All at the enterence onto Jolliff bridge rd. I am 38 yes of and am a little scared to go trapcing through the woods for clues as to what happend or where he may be. If he is found alive somewhere ... I sure want to meet him. My ❤ goes out to you and all his family. If I had the guts to go looking through the woods n down the crick and someone who would don't with me... I would search for him everyday. I wish I knew more or could report to you more than I have . so sorry but still hoping we find him. Could you please do an updates reading on Jared. It would mean alot!! Thanks!! Please email me at psychictarotinsights@gmail.com to discuss an update. New information about missing Jared hanna on January 2019. Reported to Clinton county sheriff's department.